Together we can save our wonderful Ladygrove Park from destruction. There are several ways to object and in this campaign we will use them all, but for now the easiest way is to do it online. 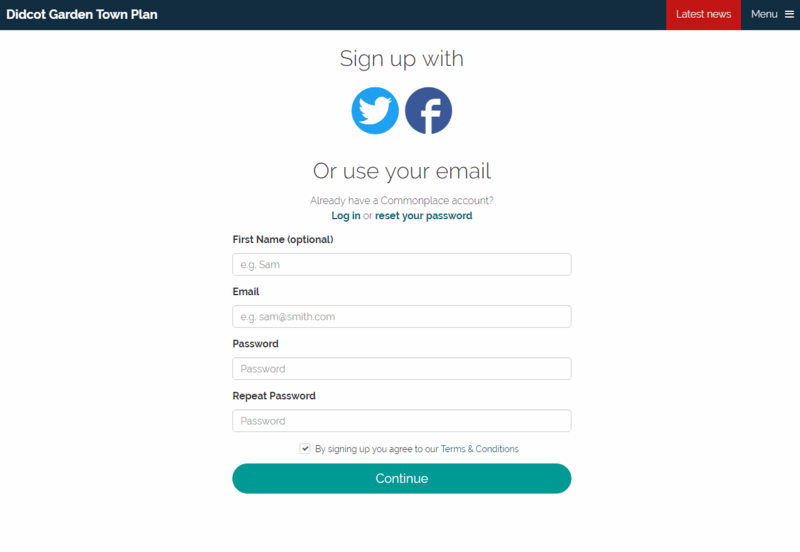 Once you have signed up they want to know MORE about you. You then get a chance to declare that you live in Didcot in the next section "What is your connection to Didcot?". Then we come to the question..
As I WANT my views to be counted I TICKED this box. You may choose to do the same. Finally they ask if they can keep in touch. If you want them to pump PR releases to your inbox you can let them, but I would rather get my information from more impartial sources. I chose NOT to tick the box and if you share my views you could do the same. 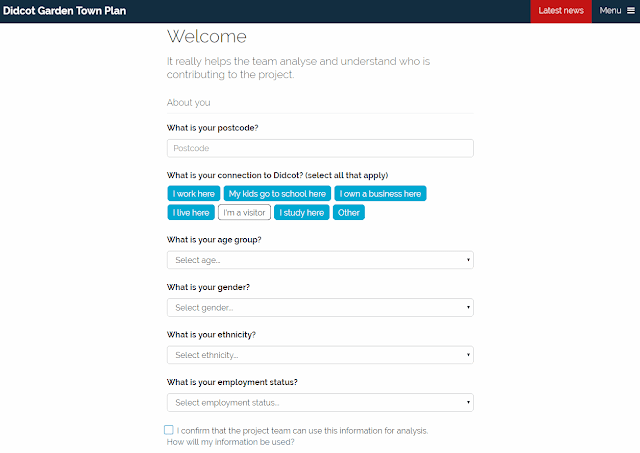 After pressing the button above they take you to the overall master plan page. This is NOT the page to comment on. You want to comment on proposal 2 (what they call Town Centre). 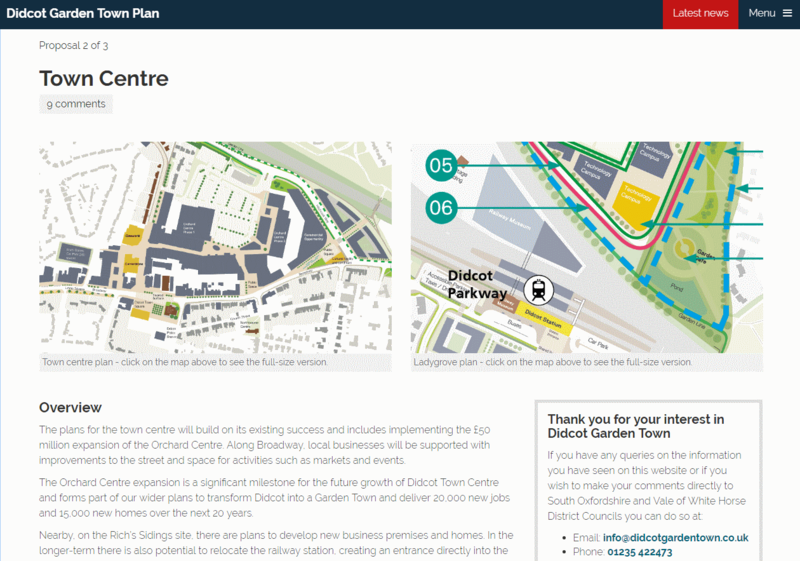 See how they have mixed together the southern gateway plan with the Ladygrove plan? This could cause comments about the Ladygrove to get lost amongst others, so we MUST stop that happening! Don't worry - it's taken care of below. Scroll all the way to the bottom. You should see this box. Finally you can say what you think! But PLEASE PLEASE read a little further before you do! Next choose the aspects you are commenting on. Many of them apply to the Ladygrove plan. This is the list I chose. 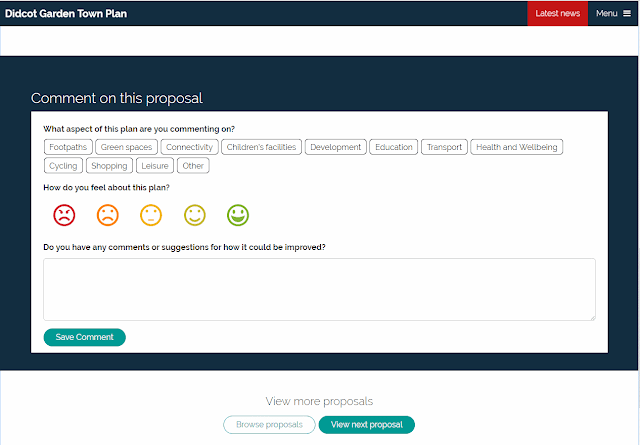 To have the maximum impact I chose to comment on the specific proposals for Ladygrove and ignore everything else. I entered a short clear 'sound byte' style comment with that specific plan. So go ahead, state your own views then paste it into the comment box. Press 'Save Comment' and you are presented with a completed comment page like this. At this point you can log out using the menu at the top right. Should you wish to see all of the comments you can use the link below. Notice how even though you chose the unhappy face and your comment is red, a green thumbs up still appears with a vote of 0? A thumbs down with a vote of -10 would seem fairer surely? Well don't worry - this is just the number of people that agree with your comment. If it goes up that's fine.